Happy New Year! Here is my December's Unblogged Files: the non-Christmas edition! 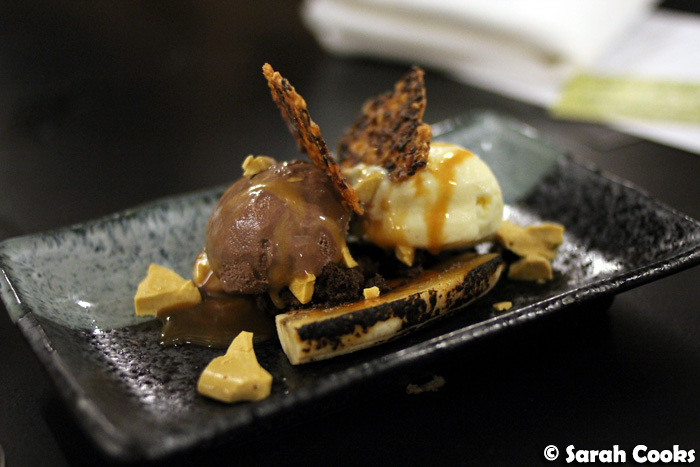 ...and the crazy decadent salted caramel banana split with honeycomb. 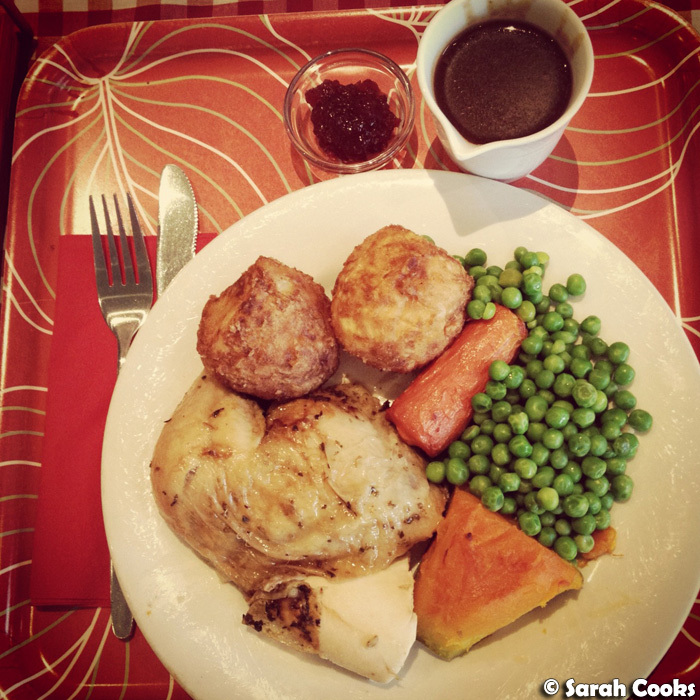 One night when I really wanted a roast dinner but was too tired to cook, (yes, it happens to me sometimes) we tried the Roast Kitchen in Kew, who do a range of trad roast dinners in a retro diner-type setting. 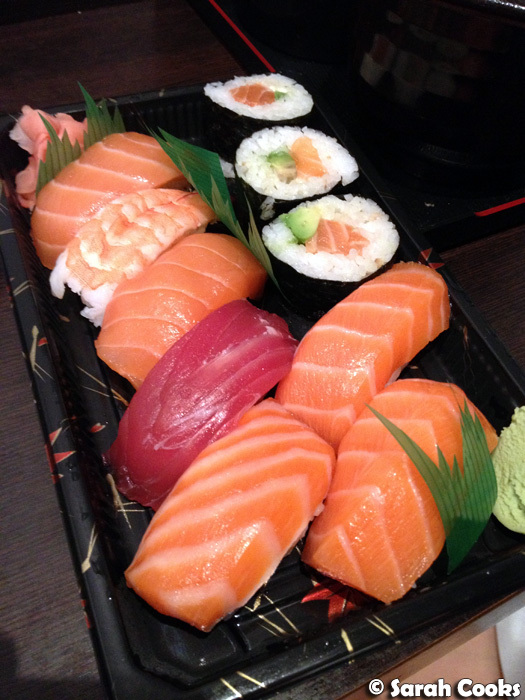 It was pretty pricey for a dinner, at $19.50 a plate, but the food was great, and they really pile up your plate! 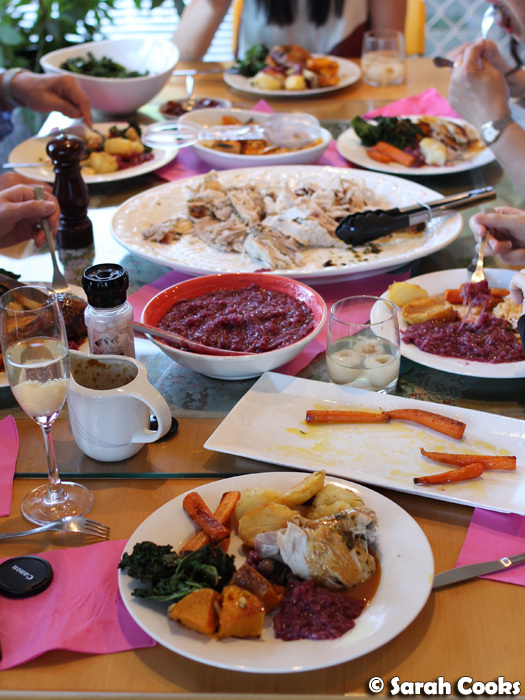 We were particularly impressed by their red wine gravy - great stuff! I've been loving the recipes in Jerusalem - I've found, despite the "coffee table book" appearance of the book, that the recipes are beautifully workable, even when adapting them to suit what I've got lying in the pantry. Examples: I adapted their lamb meatballs with broadbeans and lemon to use up some minced pork and peas that I had, and it worked wonderfully. Ditto the chermoula eggplant with bulghur and yogurt, for which I substituted couscous. Total love! I'm going to Europe next year and I cannot wait to visit their restaurants and cafes! Speaking of fabulous cafes, we brought yet another friend to Beatrix Bakes in North Melbourne: we're slowly converting all our friends to the way of Beatrix! 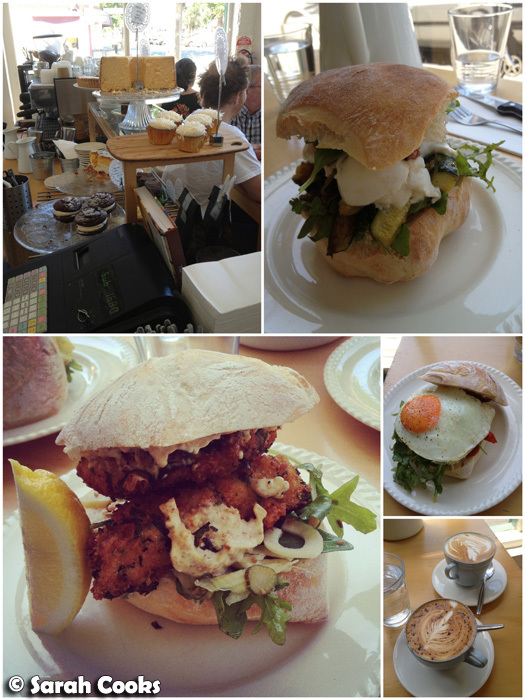 Mega love for their Fry-Day ciabatta, with crumbed flathead and fennel quickle, and The vegetarian Rocky, with tomato, buffalo mozzarella and chopped basil pesto. Gorgeous! 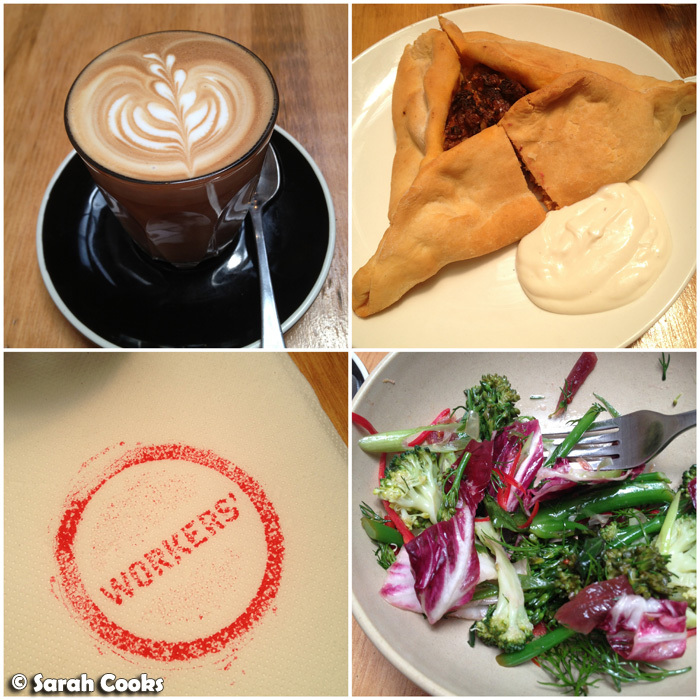 Less impressive was my one and only visit to the Workers' Food Room, on Little Lonsdale Street in the city, for a weekday lunch. Whilst the food I ordered was pretty good, I was sneakily upsold a side salad with my Lebanese chicken pastry (the waitress made it sound like they'd forgotten my salad and asked me if I wanted them to bring it out... only to have them charge me $8.50 for that tiny bowl of broccoli salad). Gah! It doubled the cost of my lunch! So irritating! Later on Twitter they apologised - apparently I was overcharged for the side salad too, they're only meant to be $6.50. Double gah! 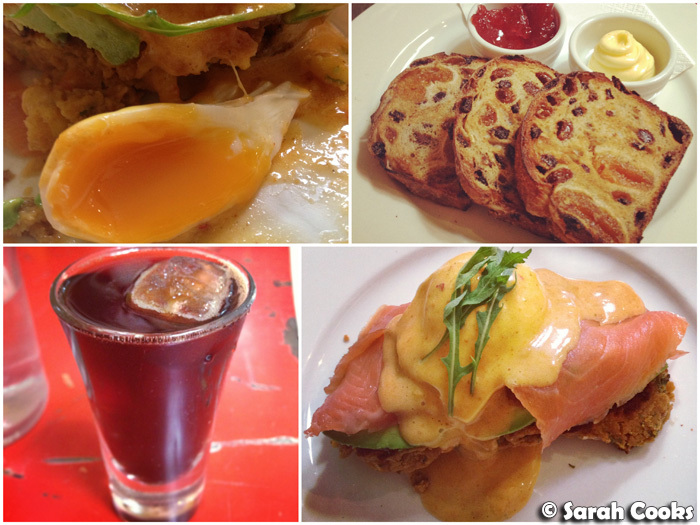 But yeah, there are hundreds of great lunch options in the CBD, not going back there! I definitely do not recommend this place! On a happier note, I was invited along to the opening day of the Yarra Valley Chocolaterie, which was a big day of sugar-filled fun! Full blogpost to come, but for now I want to show you my favourite item at their cafe, which funnily enough, doesn't contain any chocolate at all! 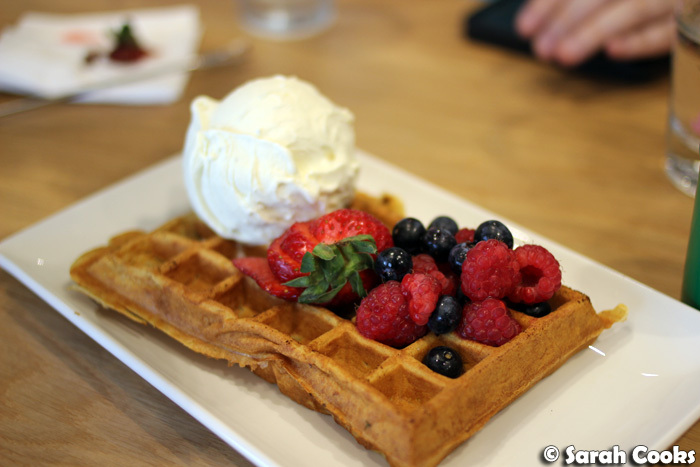 I really loved their soft fluffy waffles, with fresh berries and creamy house-made ice-cream. Excess sugar can only be combated by excess salt (or you know, healthy eating and exercise, but y'all know I wasn't in the mood for that!!). 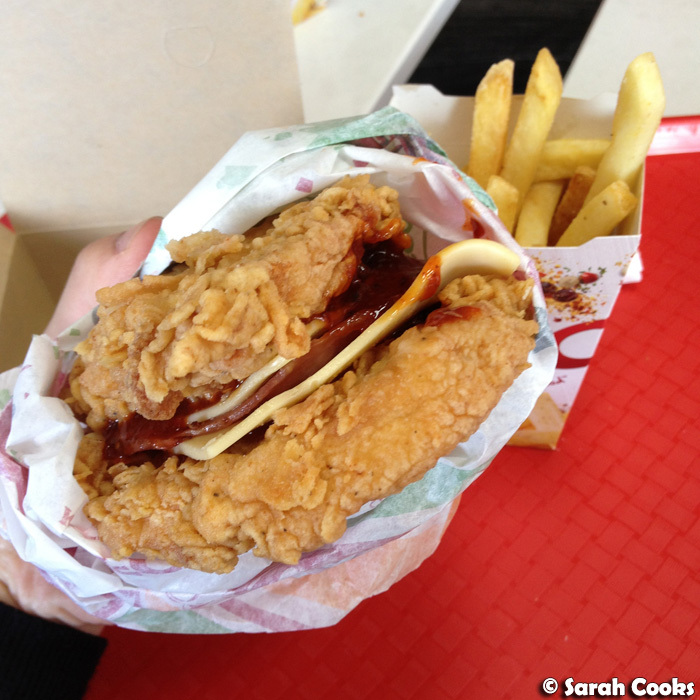 So dinner after my visit to the chocolaterie was a Zinger Double Down at KFC. Yeah, I totally hated myself for 5 minutes, but I regret nothing!! And whilst we're on the KFC theme... one very hot day when I went to see a film (it was Pitch Perfect, and it wasn't very good - Bring It On for the win! 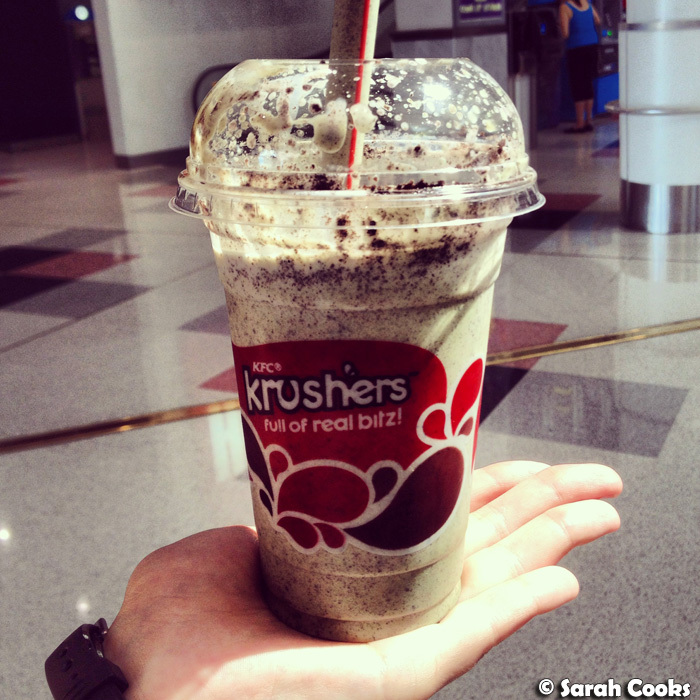 ), I decided to try one of those creamy Krusher drinks from KFC. Previously I'd never really seen the point, but I tried the mint choc one, and it was actually really really good! 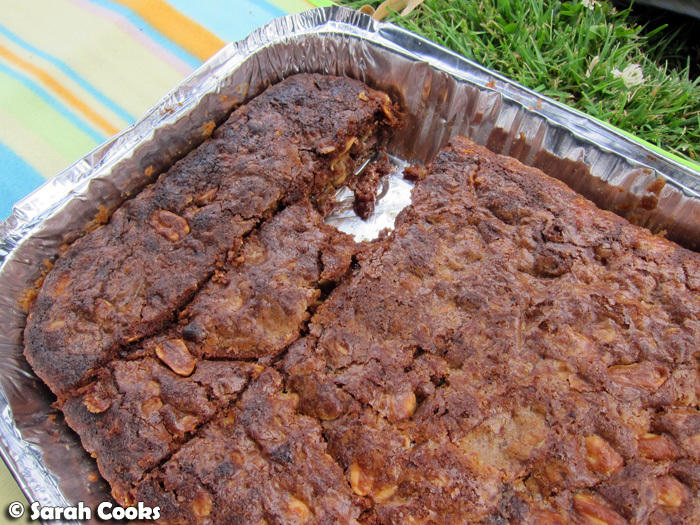 Creamy, minty, and with loads of delicious chocolate biscuit crumbs. When I Instagrammed it, loads of people told me that they love the Gaytime flavour, so I'll try that next time! 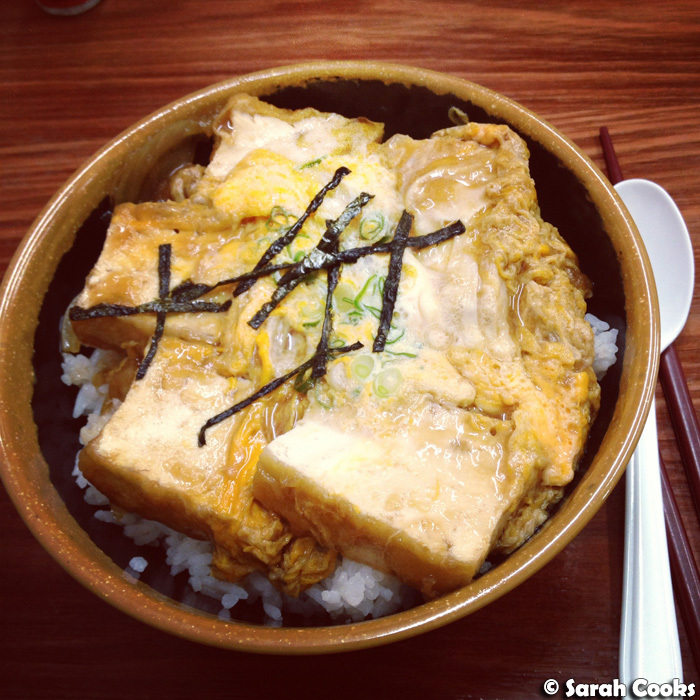 And just to prove that I do occasionally choose healthy food, let me say that I do recommend the Tofu-Don at Tokio, and the Sushi at Sushi Monger (both next to each other in The Causeway, between Little Collins and Bourke street). Both are great, cheap options for a CBD lunch! On that really hot Sunday last week, we stopped into Coffeehead in Camberwell for brunch, cold drip coffees and sweet, sweet airconditioning. The fruit toast was great, as were the corn fruitters, topped with smoked salmon and a perfect runny poached egg. 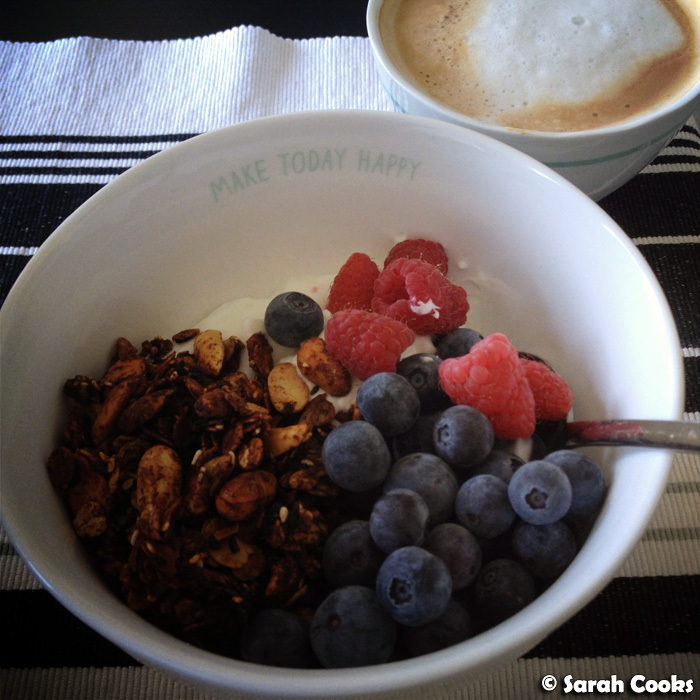 The last thing I wanted to share with you in this post is the froyo I had at Cacao Green this afternoon for a treat. (I think I'm getting obsessed with them, haha!) 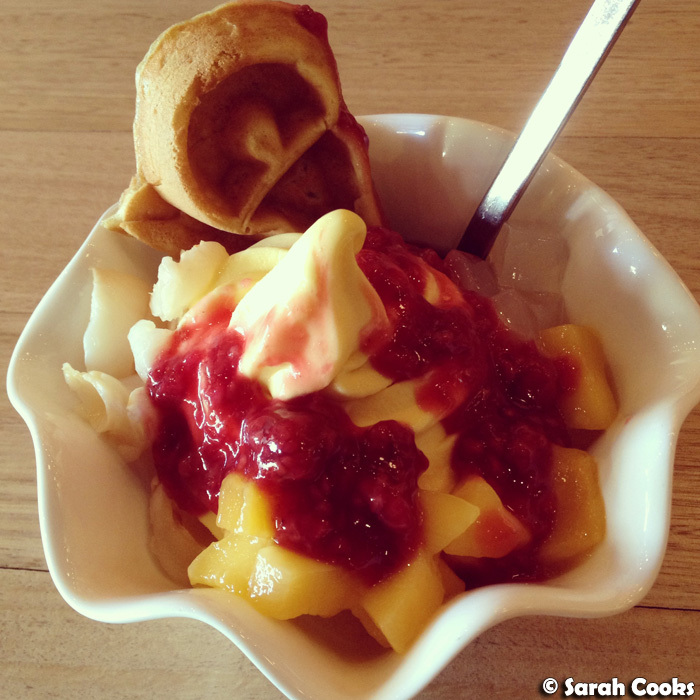 The Mango Fantasy contained mango frozen yogurt, fresh mango cubes, raspberry compote, lychees, coconut jelly and a little waffle bite. It was really good, like bubble tea in froyo-form! We were really surprised by how good the waffle bites were - they were served warm (we could smell them being toasted while we waited! ), and were fluffily doughy within, and crispy on the outside. 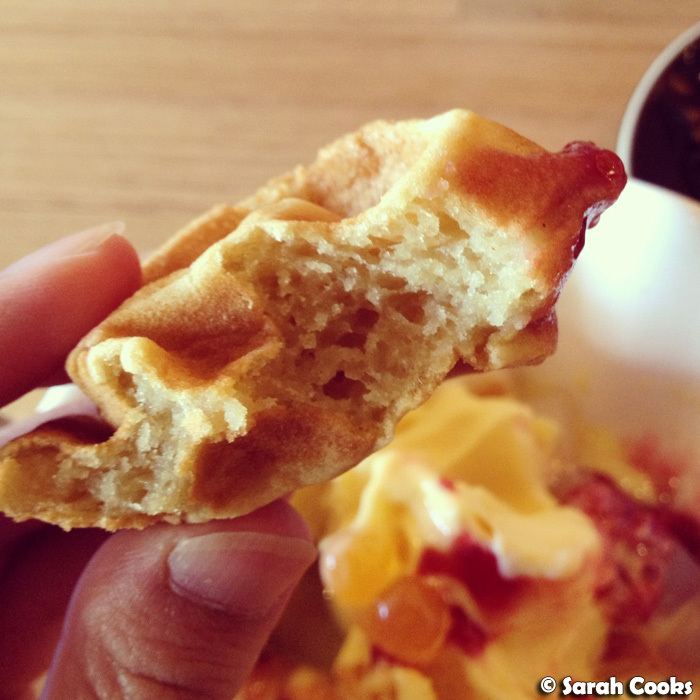 I hadn't thought that their waffles would be anything to write home about... but they were really good! Next time I'm just getting a whole waffle! And thanks to the yummy waffles from Cacao Green, I've decided to make waffles tomorrow morning for my first breakfast in the new year! Happy New Year everyone! Hope you're all enjoying the evening and spending it with those who mean the most to you!! Of course, I'll still be doing my Unblogged Files for December (I'm pretty proud of myself for keeping that up the whole year, by the way! 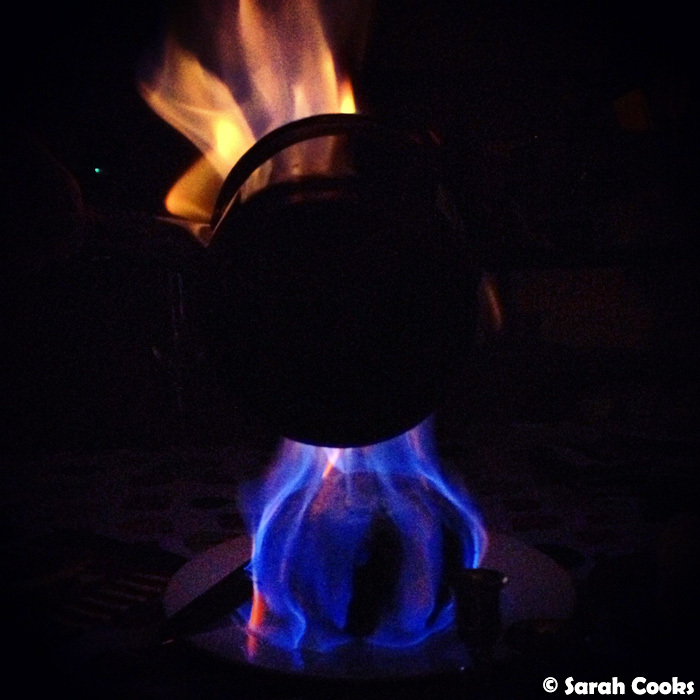 ), as well as a "2012 in Review"-type post, summarising my blog this year... but to try and keep December's Unblogged Files to a reasonable length (and because I clearly love round-up posts!) 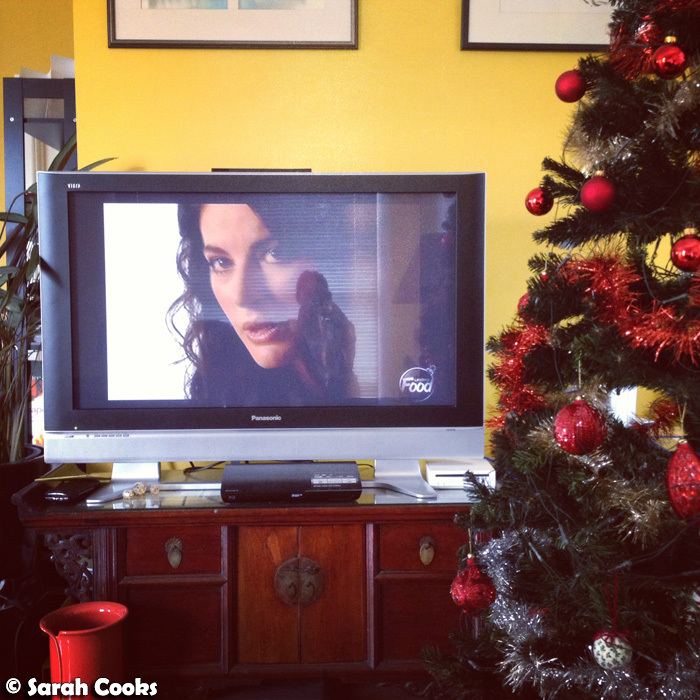 I've decided to do a little Christmas round-up post too! 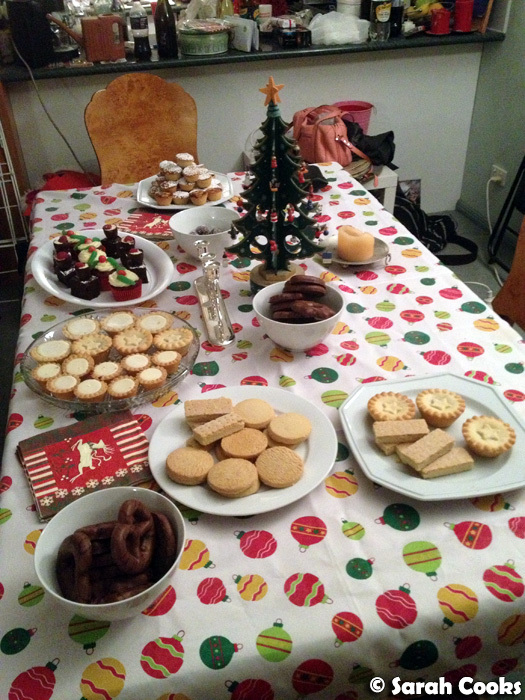 The Christmas season started with a party at a friends' house, to which I brought my mince pies. 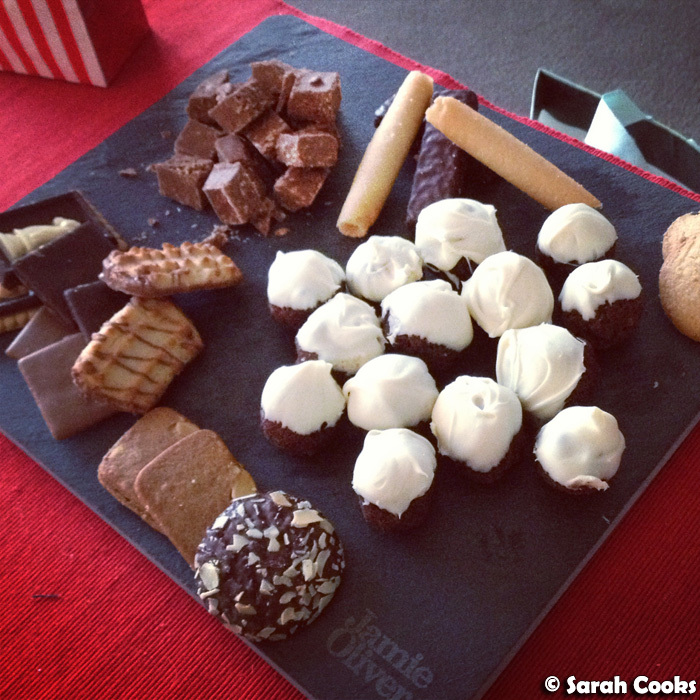 I loved the spread of baked goods - super cute! I did get teased for requesting a cup of tea at 10pm on a Saturday night - how very Miranda of me! - but you just can't have mince pies and shortbread without tea! 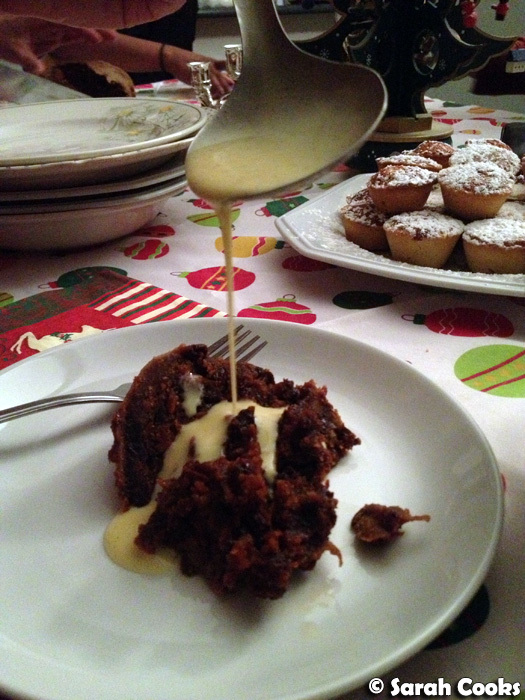 As you know, my Christmas Cake this year was Nigel Slater's Christmas Cake. 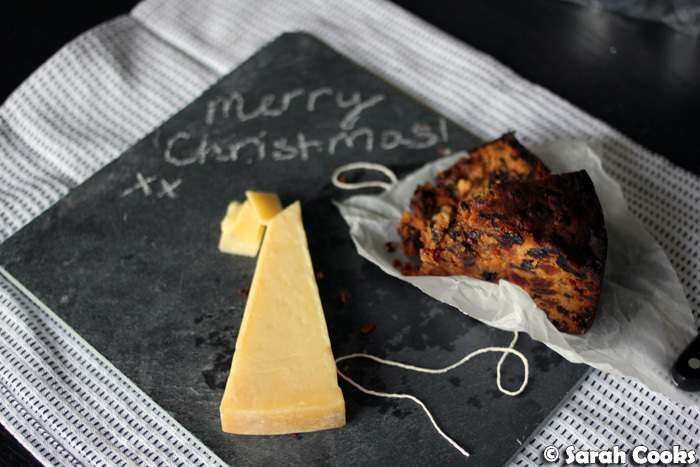 That's another thing I love about Christmas: dried fruit and spices galore! 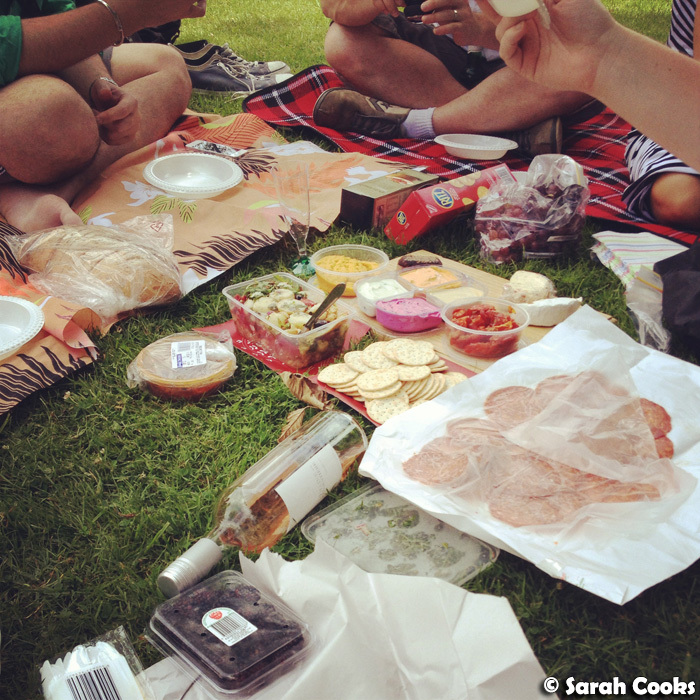 We had a great afternoon, drinking rosé, eating picnicky food (cheese, dips, salami etc.) and generally soaking up the atmosphere. Love! And of course, there was our big Turkey dinner, held on Christmas Eve at my parents' place. I also wanted to show you some of the cool foodie gifts I got! These cute and pretty ceramic pieces from Kikki K's new home range (I love the little bowl so much - it really makes me smile! 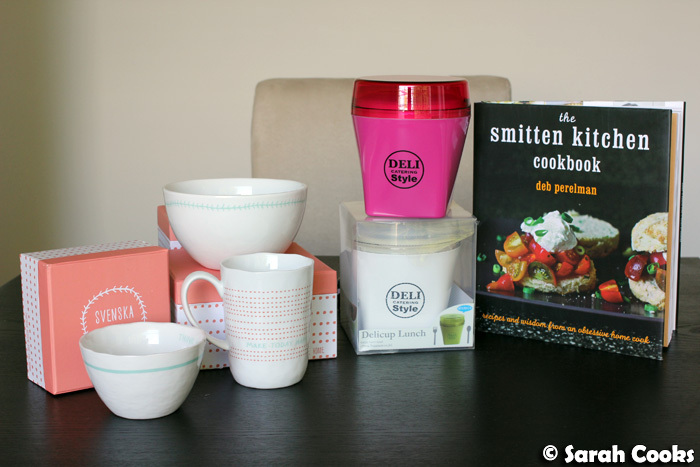 ), these fab "Delicup Lunch" containers from my brother in Japan, and The Smitten Kitchen Cookbook! 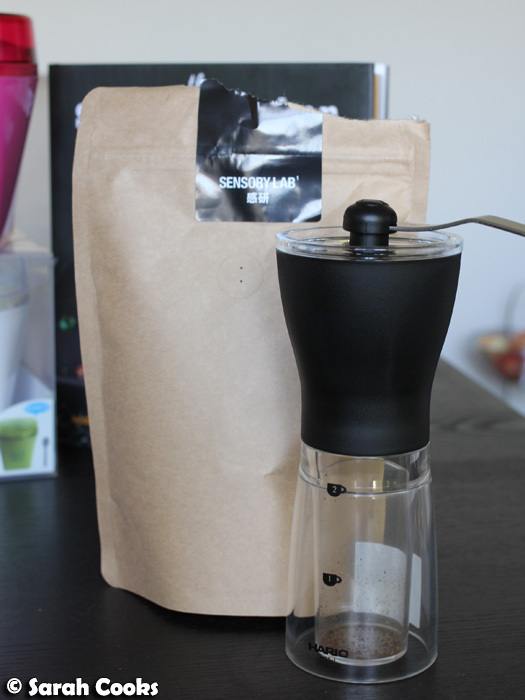 I bought this cute Hario Mini-Mill Slim Plastic Coffee Grinder from Sensory Lab for Sandra, as well as a bag of Chompy beans. The guys at Sensory Lab were so nice and helpful when I went to buy it - despite being busy, they gave me loads of time and advice, and even ground up a few samples of coffee for me to take home, so that I could see what the different grinds are supposed to look like for different brewing methods. How nice is that? Thanks guys!! Christmas also means Christmas leftovers. 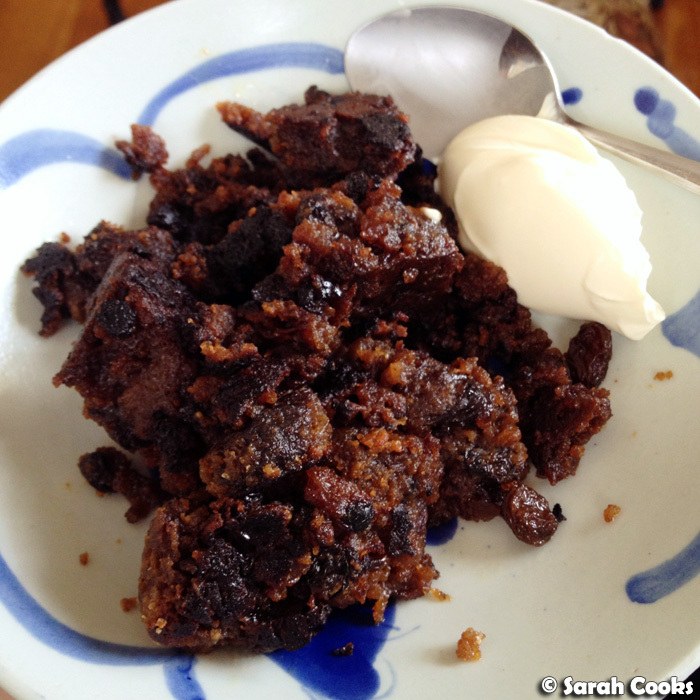 Breakfast on Christmas day was leftover Christmas pudding, fried in butter (eep!) 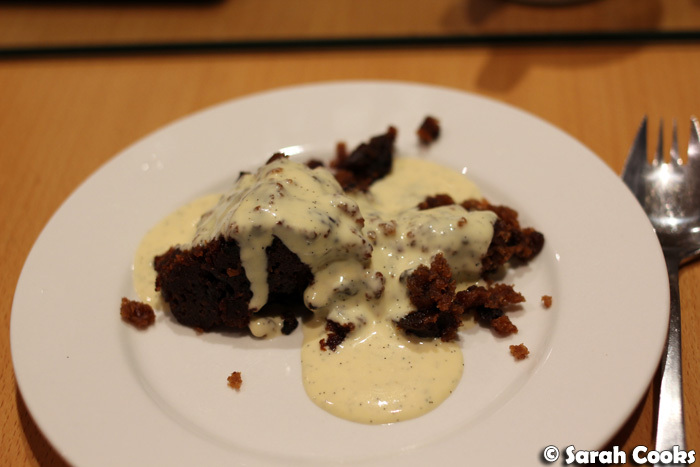 and served with a little quenelle of creme fraiche. 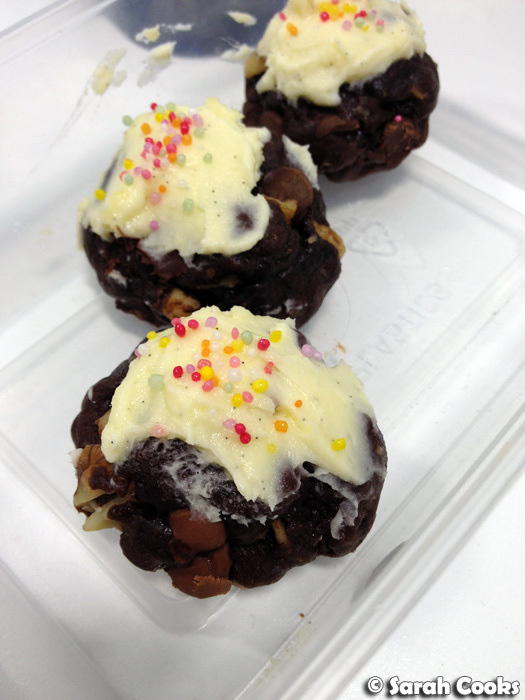 I also used the leftover Christmas pudding to make Christmas Puddini Bonbons again. I've been whipping them out whenever people pop in. (As well as some fancy German Christmas biscuits that my Dad bought us, and some coconut rough that I got at the newly opened Yarra Valley Chocolaterie). 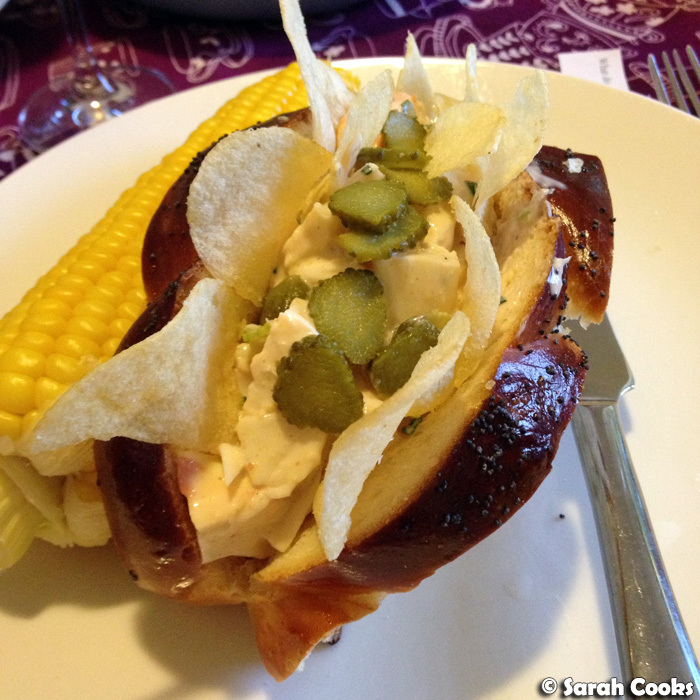 I made a couple of fun things with the leftover turkey, including the Best Sandwich Ever! 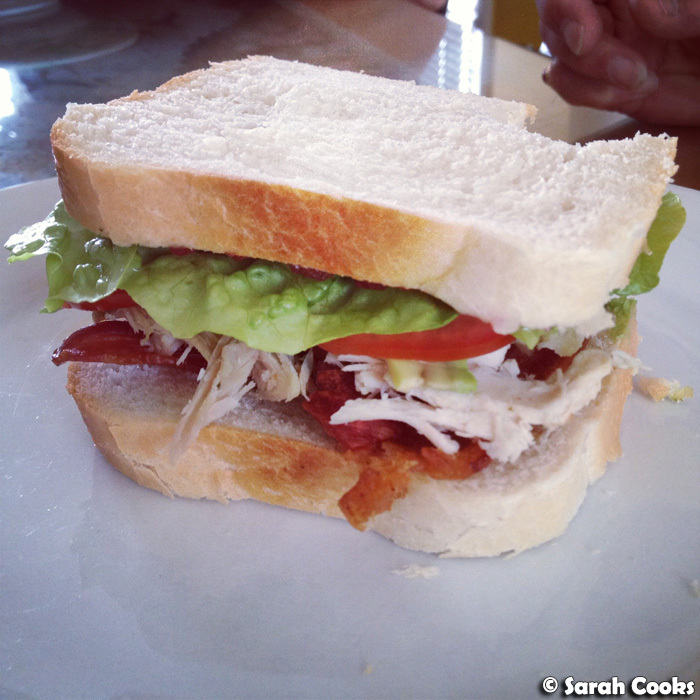 White bread, turkey, crispy bacon, lettuce, avocado, tomato and cranberry. And because sometimes even I can get tired of Christmas food: I made Fuchsia Dunlop's claybowl chicken, using leftover turkey. 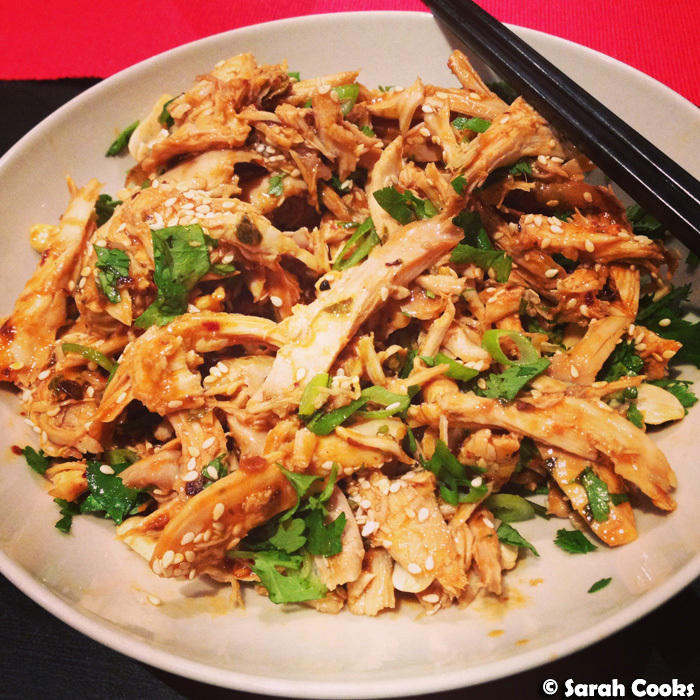 Essentially it's just cold cooked turkey, dressed in a mixture of sesame paste, soy sauce, black vinegar, sesame oil and loads of chilli oil, tossed with crunchy roasted peanuts and sesame seeds and topped with pungent coriander and spring onions. 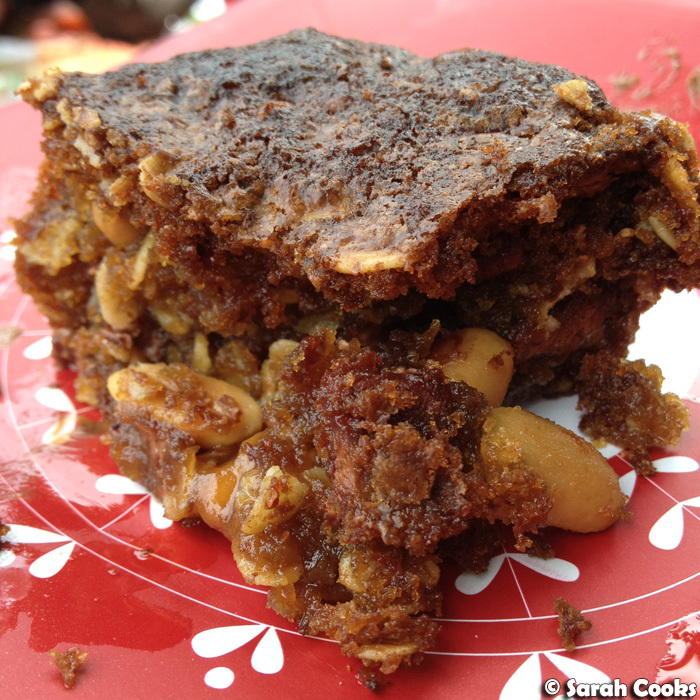 Spicy, low-carb and punchily flavourful - it's the antithesis of Christmas food, and totally delicious. 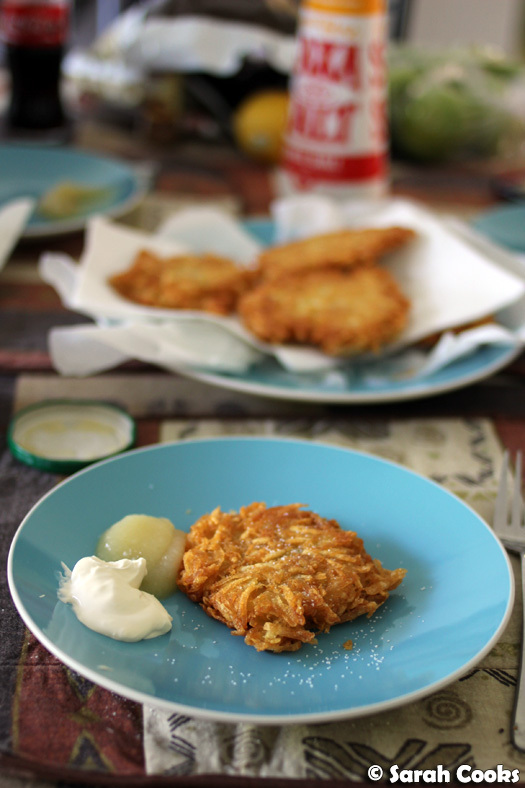 And finally, today we had a little latke party at my friend Jess' house. I know we were a bit late for Hanukkah, but there's never a bad time for latkes! Jess made fab potato latkes, and we had a go making apple latkes too. I'll blog them in more detail soon - you all need fried potato pancakes in your life! Jess does her latkes very simply: just potatoes, flour and egg. So delicious! Just quietly, I like them better than Nigella's latkes from How to Eat! 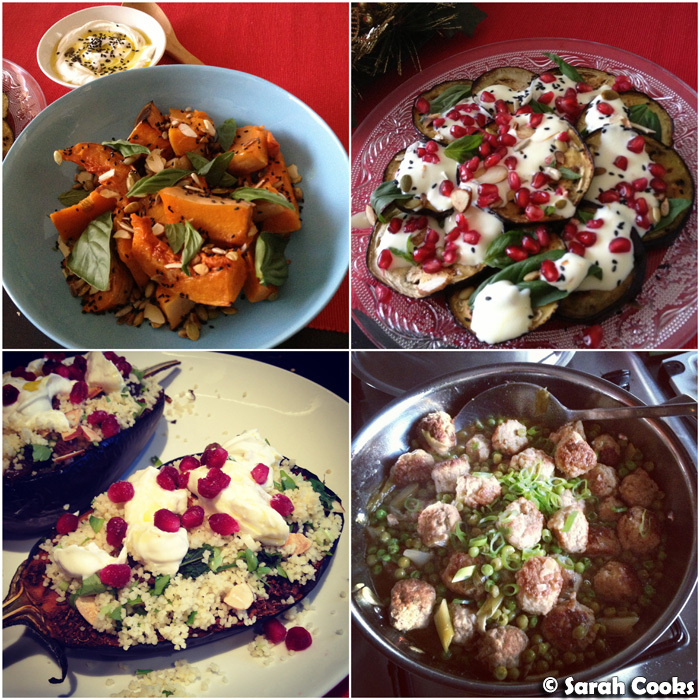 Hope you all had a great festive season and enjoyed some good food and quality time with those nearest and dearest!! 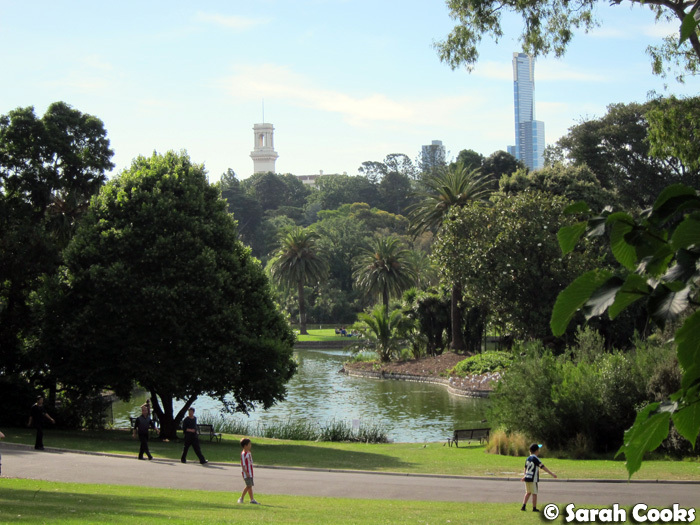 What are your favourite things to do over the break? Merry Christmas everybody! I hope you've all been enjoying the silly season and eating way too much! 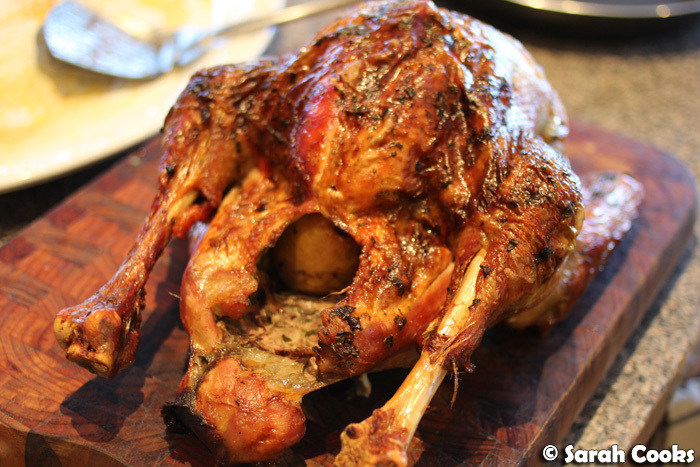 We had our family dinner on Christmas Eve, and here's what we ate! 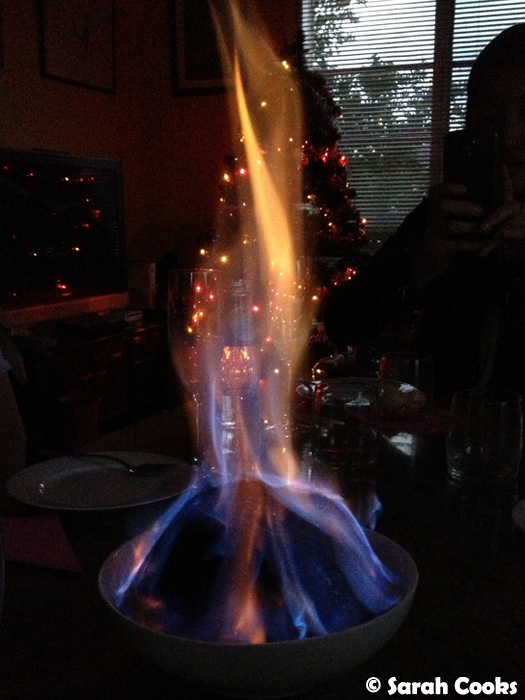 As you can see, the menu I chose was similar to last year's Christmas Dinner, with just a few little changes. I love, love love Gordon Ramsay's turkey and gravy - pure juicy deliciousness and no need for any brining or other difficult tricks. 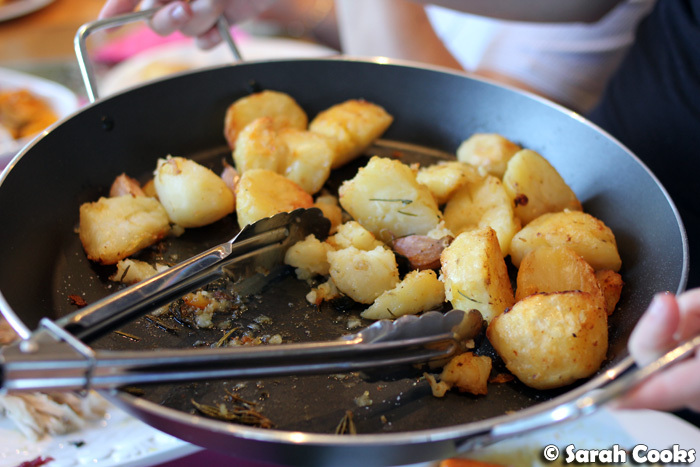 The potatoes were Jamie Oliver's perfect roast potatoes, roasted in butter (zomg! ), with sage, rosemary and garlic for extra flavour. They're crispy, chewy, fluffy and gorgeous! 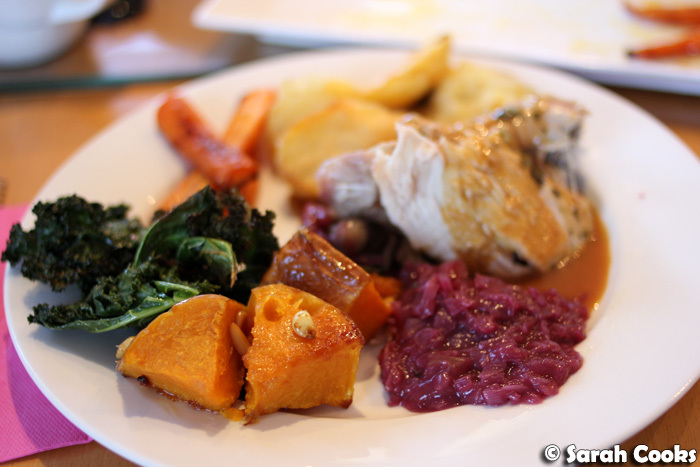 The other sides were our usual red cabbage, some crisp roast kale (great for texture contrast and extra vitamins), roast carrots (just roasted in some olive oil with a little salt and pepper) and some roast butternut squash with sage and pine nuts. Woah! Next year I'll just be able to bring up this post and start cooking! Future Sarah: you're welcome. 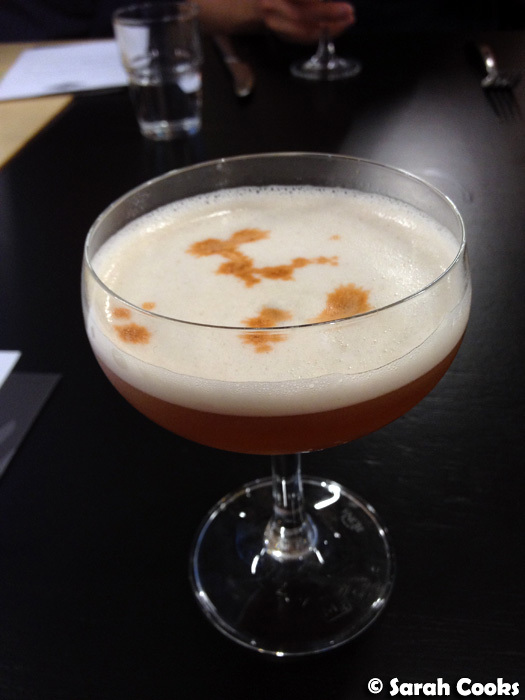 At this point in the post, I feel it's time for a little drink! 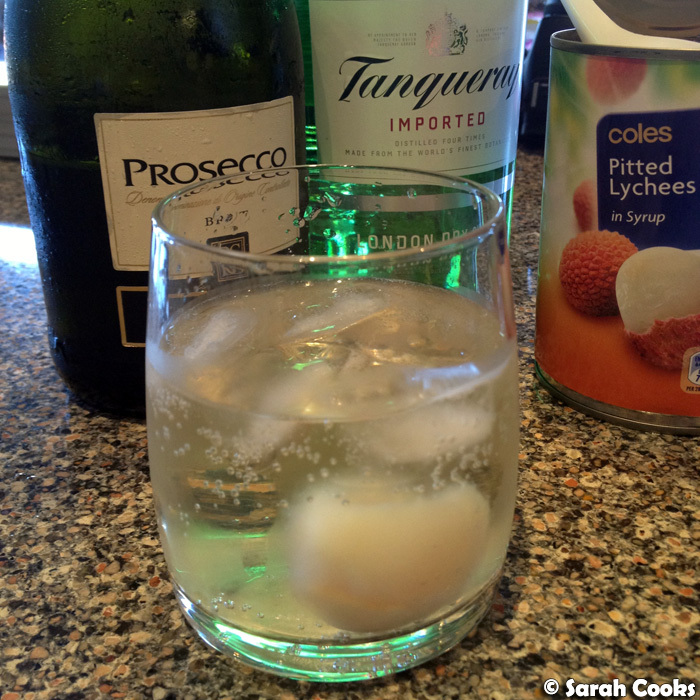 Sandra made an awesome Christmas cocktail, inspired by the "Pig" cocktail at Spice Temple: Prosecco, gin and lychee syrup, lychees and soda water. Cheers! Stir together 125 grams soft butter, 2 minced cloves of garlic, the zest of one lemon (keep the lemon for the cavity), a small handful chopped parsley and some salt and pepper. Loosen the skin under the turkey, and spread the flavoured butter under the skin. Spread any extra butter on the outside of the skin, season with salt and pepper and drizzle with olive oil. Place 2 peeled and halved onions, the zested lemon, and a few garlic cloves in the cavity. Roast the turkey, breast side up, for 15 minutes. Turn the oven down to 180C. 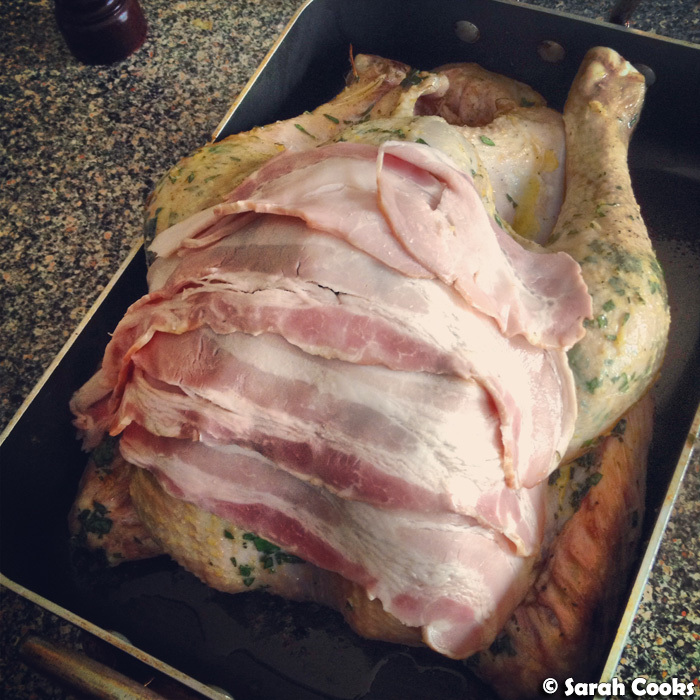 Cover the breast with 4 slices streaky bacon, and roast the turkey for 30 minutes a kilo, or until cooked. (Test by piercing the thickest part of the thigh - the juices should be clear, not pink). Place the turkey on a platter, remove the bacon blanket and all the flavourings from the cavity (keep it all for the gravy!). Tent loosely with foil and allow to rest for at least an hour. Pour as much fat out of the roasting tray as possible. Add the bacon and flavourings from the turkey cavity to the tray, with 2 chopped tomatoes and a sprig of rosemary. Cook on a medium heat for a few minutes, stirring to get all the sticky deliciousness off the tray. Pour in a bottle of dry white wine, and allow to simmer strongly until reduced by half. Pour in 600 millilitres of chicken stock, bring to the boil and simmer strongly for about 10 minutes. Strain the gravy and discard all the extra bits. Thicken with a mixture of flour and milk, if desired. Serve HOT. 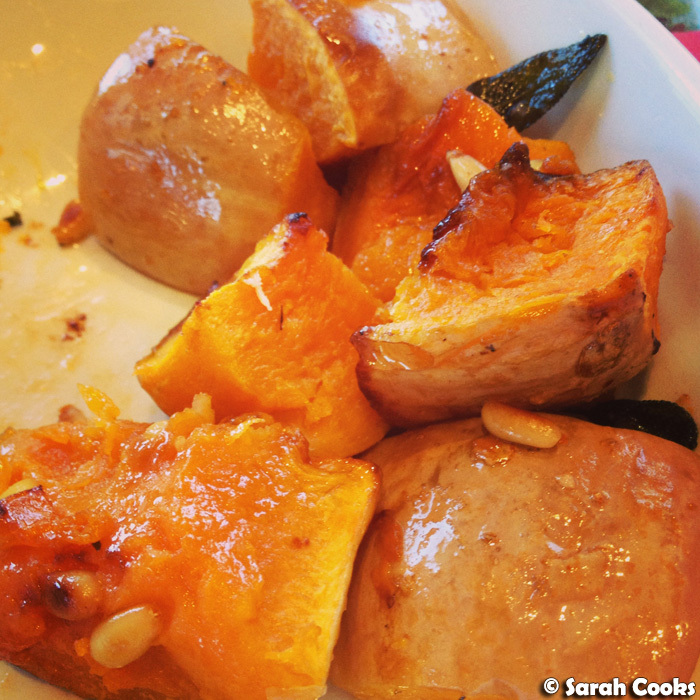 Wash one butternut squash. Trim the top and bottom, cut in half lengthways and scoop out the seeds. (No need to peel). Toss with olive oil. 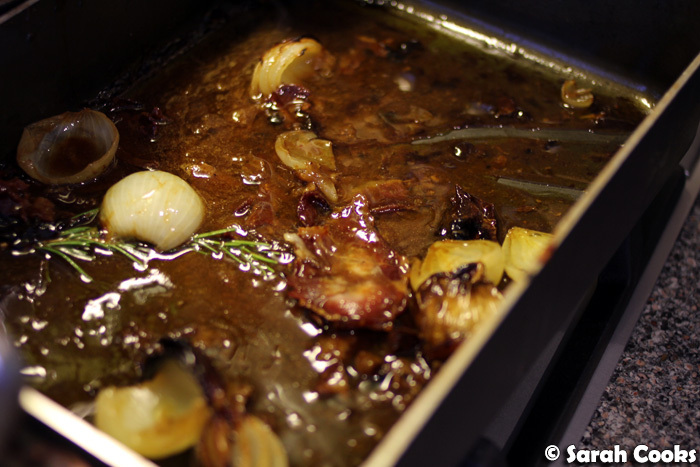 Place in a baking dish, and roast at 180C for 20-30 minutes. Add a few sage leaves to the tray and allow to cook for another 20-30 minutes, until the sage is fragrant and the squash is softened and nicely browned in parts. 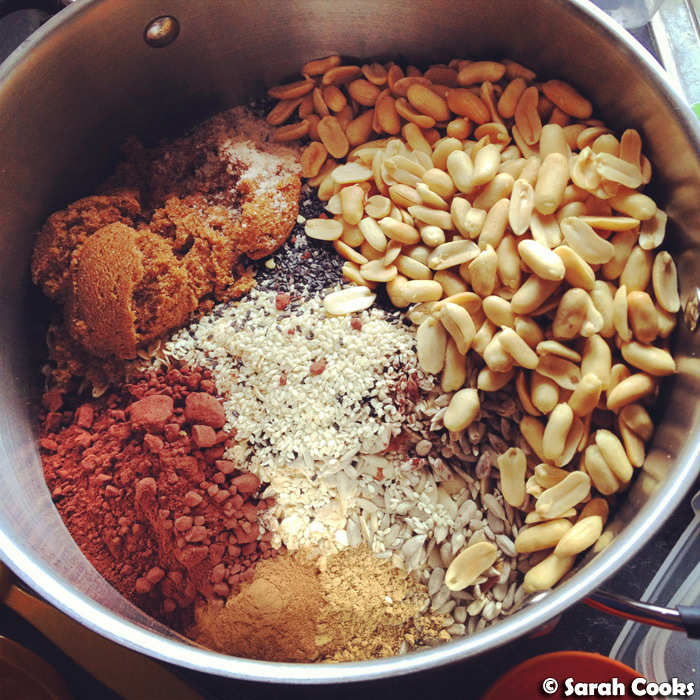 Sprinkle over toasted pine nuts to serve. Peel 2 kilos of roasting potatoes, cut into medium chunks and rinse off the starch. Place the potatoes into a large pot of cold water and add a generous spoonful of salt. Bring to the boil and allow to boil for 10 minutes. Drain the potatoes and allow them to steam dry. (This can all be done in advance). Place 100 grams of butter and a drizzle of olive oil in a large roasting tray, and place in the oven so the butter can melt and the tray heats up. (I just put this under the turkey for the last 10 minutes of its cooking time). 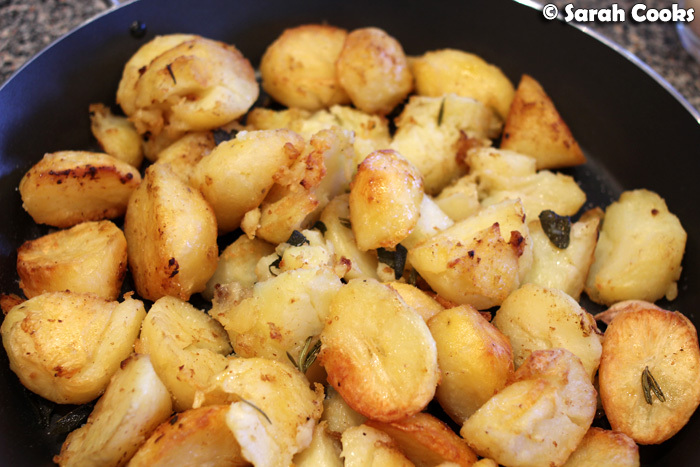 Carefully place the parboiled potatoes in the tray and toss to coat in the melted butter. Roast at 200C for 30 minutes. Meanwhile, in a small bowl, mix together the leaves from 2 sprigs of rosemary, a small handful of sage leaves, 3-5 unpeeled garlic cloves, a drizzle of red wine vinegar and olive oil. Take the potatoes out of the oven and squish them down flat with a potato masher (for extra crispness). Pour over the herbs and garlic, and place back in the oven for another 30-45 minutes or until really crispy and delicious. Season generously with salt to serve. 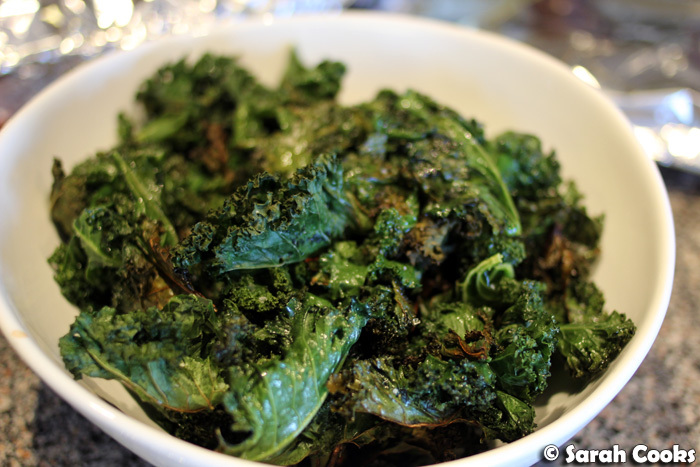 Remove the tough stems from one bunch of kale. Rip the leaves into smallish pieces, wash under running water and dry thoroughly using a salad spinner. Place the leaves in a large baking dish in a shallow layer, pour over a couple of tablespoons of olive oil, and toss with your hands to coat. Roast at 200C for 20-30 minutes, until it smells cooked (you'll understand what I mean when you cook this yourself), and the leaves are mostly crisp. Season generously with salt. So much food! So tasty! So good! 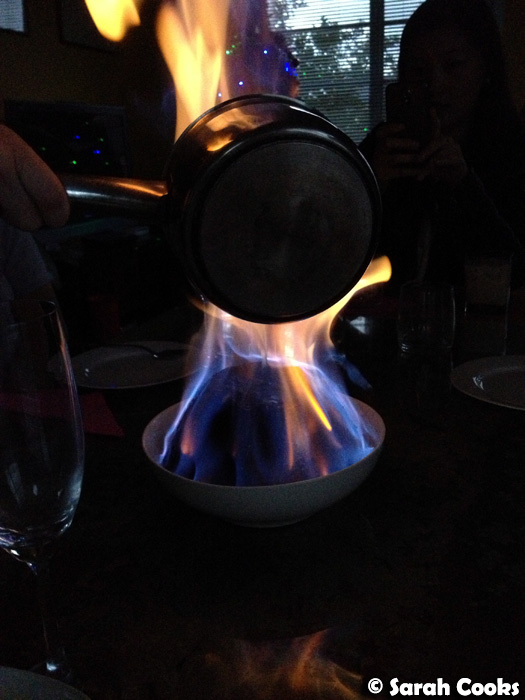 And once the pretty flames subsided, it was time to eat! One year in the freezer and still good! 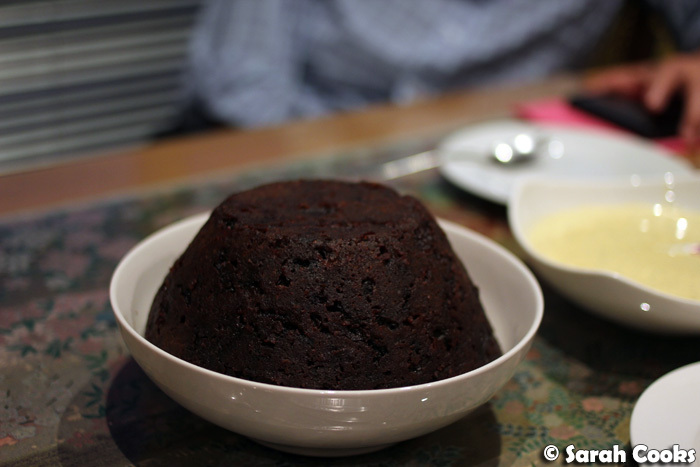 So moist and wonderful - this pudding is fantastic, you must try it! I think I went a bit OTT with the vanilla bean (1 massive vanilla bean to 300 ml cream, 3 teaspoons caster sugar and 3 egg yolks) - but hey, it's Christmas!